it's a bit of a cliche, oft times seen in films or humorous television programmes, that washing the car on a summer sunday afternoon is a truly middle class occupation, performed regularly out of a sense of duty rather than having anything to do with the car being dirty. should evidence be required to prove the veracity of my contention, how often do you see this being done during the winter months? with the amount of crud on the roads at present, certainly locally consisting not only of grit distributed on the road surface when entirely unnecessary, but also the more animalistic variety engendered by life in an agricultural community, every day would be a good time for the bucket of soapy water and a sponge. but no, this is not an activity that has advertised itself by regularity in recent months. the advantage that car drivers have over us superior beings, is that when encountering the aforesaid muck and awe, their clothing is likely to remain as immaculate as it was upon leaving home; not so the hapless cyclist. which rather brings us neatly round to the question that has almost as much importance as the perennial campag or shimano debate (why is it that so few drag sram into this question? ): mudguards or no mudguards? after watching kuurne-brussels-kuurne last weekend, run off in apalling weather conditions, those with sporting aspirations would be correct to point out that our heroes and sufferers had not one mudguard between them. not even a crud roadracer. granted, in the prevailing cold, wet and wind, mudguards would have achieved about as much as a chocolate fireguard, but it is also worth noting that there are people paid to deal with hypothermic cyclists during and at the end of such events. so unless you have a mavic car in close attendance during winter ventures, the comparison is hardly valid. of course, many a formula one race bike has clearances that would hamper a sheet of toilet roll, let alone something resembling a mudguard, and i don't doubt that a mid-race wheel change would be less than snappy, all for the sake of a smidgeon more rain cover. so no, the pros do not, nor are likely to, opt for a pair of mudguards. we, however, would be lucky to receive a smile from dave brailsford, let a lone a pro contract. the most we'll ever get from sky is the offer of a free hd box (with £60 installation fee), so the defence is rather weak, if arguing against is in your manifesto. i am a great believer in a clean and shiny bicycle; strangely, because i am overweeningly untidy in almost every other aspect of my life, and i also prefer to keep my stylish cycling apparel in the same condition as the shiny bike. 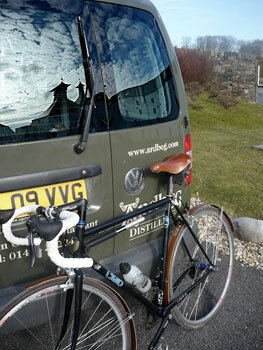 the only solution i can come up with that will help me maintain both in the face of adversity is a pair of mudguards. now i know we have trodden this path before, and even had a competition to give away a pair of pete tompkins' stealth guards for true race bikes. but where the steed du jour has adequate clearance, along with the necessary threaded bits with which to affix proper guards, then the choice is opened up. and despite a hard-won reputation for designer scruff, it is important to some of us (me) to have the same degree of style apertaining to the bicycle as that paid to on-the-bike dress sense. thus i opted to fit something just a little more smooth and decorous to the shiny black cielo. i know that those of us in britainshire refer to them as mudguards, but fenders seems to fit the context far better than the anglicised connotation, so i will stick with the proper name and give the impression that i am a man of the world. 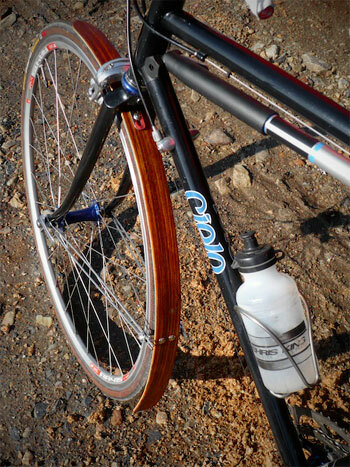 these magnificent items are retailed by river city bicycles in portland, oregon, beautifully made from quaity wood with stainless steel fittings. there are even bridge components available should your bicycle have limited clearance under the forks or calipers. in the case of the cielo, the shimano calipers are 57mm drop, and the inclusion of mudguard/fender threaded eyes on the forks and rear dropouts rather hints that fitting of such might not be too much trouble. the chainstay bridge on the cielo contained an allen bolt for the very purpose of fixing the forward leaf of the rear fender, though the thickness of the wood prevented use of that particular item, so i used the washer and bolt that arrived with the fenders. a plastic coated clip was also provided to affix to any non-drilled chainstay bridges. in terms of those carbon formula one bikes, you might need some degree of ingenuity that i'm glad i didn't have to come up with, since few of the models i've seen know what a chainstay bridge is, let alone have a bolt drilling. what i had thought might prove a bit of a challenge failed to worry the fit at all; the sram front gear mech clamp is offset to the rear of the seat-tube, and i was ready with hacksaw to remove a small sliver of wood to enable the curve to retain its trajectory towards the bolt. in practice, this turned out to be a groundless fear. however, the clamp did restrict some adjustment when it came to tyre clearance, and this is where you would be so glad of a pair of standard, old skool, road dropouts, meaning the wheel can be pulled all the way back to clear the underside of the fender. 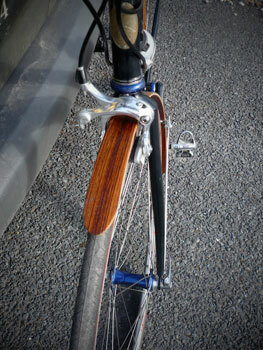 if you're on the more common vertical dropouts, a course in woodcraft might come in handy. contoured washers at the wooden end of the stays pinch the latter towards the bracket fitted to the fender; loosening the bolt a few turns allows for height adjustment above the tyre. while my fears regarding rear fender fitment had not been fully realised, fitting the front proved more problematical than i had anticipated. you'd think that this would be the easier of the two. both problems referred to the brakes but in slightly different ways. firstly, there is a washer between the fork crown and the serated nut that holds the calipers together. leaving this in place meant that the caliper bolt that fits through the rear of the fork, didn't reach the threads, and the alternative titanium bolt i had to hand, was too long to tighten all the way. therefore this washer had to be removed in favour of the top mounting bracket of the front fender. of course, nothing could be that simple, because without the washer, the bracket which is slotted to allow height adjustment was now pinned against the lower part of the headset crown race, preventing the caliper from being slotted back into its rightful position. the only option here was to file down the top of the bracket until it would allow correct assembly. some bicycles look fine without mudguards/fenders, and i would place the cielo in this category; but some bikes look ruddy amazing when such have been fitted, and the cielo is now a signed up member of this category too. 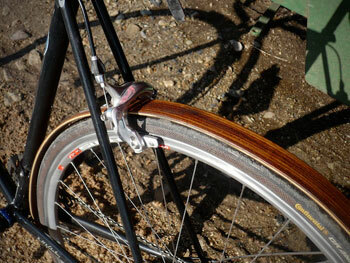 i had asked mark ontiveros of river city bicycles, to send whichever full wood fenders he thought i might appreciate, so the ones you can see in the photographs are in zebra wood. and while i would previously have thought that improvement to such a fine bicycle would have been a hard sell, it now looks quite magnificent. it didn't rain today, so their effectiveness in precipitation has yet to be discovered, but knowing portland's propensity for rain to be akin to our own, i forever look forward to wet, but clean rainjackets and softshells. and just so's you'll know, i'll be smug with it. full wood fenders are available in surfer (two tone) at $200 (£133) per set, and wenge, zebrawood, cherry, walnut, purple heart and mahogany for $150 (£100) per set. the price does not include postage, and if you're on this side of the atlantic, you will likely have to pay a modest amount of vat, courtesy customs and excise. for those without adequate frame clearance, you can purchase reacharound brackets.